Who are they? UK power trio echoing the sounds of Seattle. Sounds like: They've been raised on a staple diet of grunge. Why should you check them out? New EP Exit is a hugely promising slab of grunge/alt-rock with one foot firmly in Seattle circa 1992. Just take a listen to the frankly awesome 'Eclipse' to see what we mean. 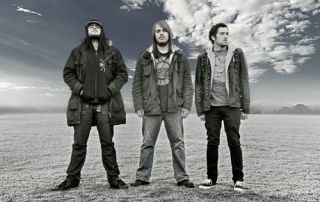 But, there's more to Bad Sign than meets the eye, that much is apparent even on this five-track taster of their sound. 'Inertia' takes Muse-esque stadium-sized hooks and gives them the Bad Sign treatment, while 'Exit' is an atmospheric CD closer to savour. Certainly ones to watch.